Update: Wong Choon Wah passed away this morning. He was 68 years-old. May his soul rest in peace. THE general consensus among ex-international sportsmen and women is that they are a neglected lot. They complain that they are neither recognised for their past feats and sacrifices nor their services to their respective sports. While a handful of ex-international sportsmen and women are involved in various sports associations, it is a fact that a large number of them have been left out. This issue has been raised many a time but the sports associations have not been very receptive and are still helmed by royalty, politicians, wealthy individuals and, in some cases, individuals who do not have any sports background. While some of the ex-athletes say that sports associations should be run by sports people, many are not interested in helming them. They just want to give back something to the sports fraternity, like coaching and administration. 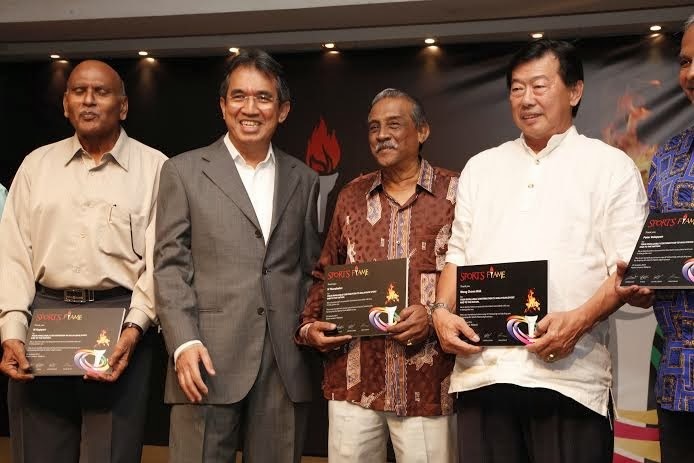 The voice of these ex-athletes was loud and clear at the Sports Flame dinner organised by four veteran sports journalists of the 1970s and early 1980s (George Das, R. Velu, Fauzi Omar and Lazarus Rokk) at a leading hotel last Saturday. The four, who are passionate about Malaysian sports and who enjoyed the glorious and golden sports moments of the 1970s and early 1980s, wanted to show their appreciation for the athletes of that era, many of whom have been forgotten. It was the second year the event was organised where several athletes were honoured with a simple plaque, but it is the thought that counts. Also present at the event were other sports journalists, sports editors, photographers, sportsmen and women of the era, including the 1975 World Cup hockey team, and veteran sports officials. It was indeed a nostalgic night and as the former athletes and veteran sports officials spoke of their era and the present day, many pertinent points surfaced, many of which we have heard over and over again. A key point they raised was the school system where sports is not emphasised as it used to be. They talked of the lack of dedicated sports teachers, the disappearing playing fields, the lack of emphasis on physical education on the school timetable and students who have so many other things to do than sweating it out under the sun. Others said it is because parents prioritise studies – where students have to attend tuition class after tuition class, leaving them with no time to go to the fields in the evenings – that the standard of sports has dropped drastically in the country. They pointed out that children these days also prefer playing indoor games than being out there in the fields rain or shine. No wonder no talent is emerging from the schools. Some reminisced about the days when sports in schools started with inter-class games, followed by inter-house before moving on to inter-school, inter-district and then national and international. These days, almost all sports are held on a carnival basis and only a selected few are involved. Those days, there were even inter-house swimming meets organised by the schools when there were few swimming pools. But today, with so many swimming pools, schools hardly organise meets. Athletic meets were held almost every week and schools invited other schools to compete in inter-school relays, which was the highlight of each school’s meets. Today, with the fields disappearing and exorbitant stadium costs, these meets have been reduced to carnivals with minimum events. “Sports in schools those days and even the national teams was a 1Malaysia affair. It was the mixed balance that gave overall strength. Just look at the 1972 Munich Olympics football team, which had players from all races,” said Peter Velappan, the former secretary-general of the Asian Football Confederation and team manager of the Malaysian football team to the 1972 Munich Olympics. Then, many of the ex-athletes spoke about not being given an opportunity to lend their expertise to schools or sports associations in their development programmes. “We are not asking to be paid high salaries. All we are asking is an opportunity to work with the children in the schools and impart our knowledge,” said Sri Shanmuganthan, the 1975 Malaysian World Cup hockey team skipper. Former Malaysian Hockey Federation secretary and international hockey umpire, G. Vijayanathan, said that sports officials should be former sportsmen and women. “Sports associations should be led by former sportsmen and women so that the passion is pure and their sole interest is sports,” he commented. At the end of the night, all left with a wide smile that there are some who still recognised our forgotten athletes, but deep inside they were sad that they could not return to the sports they are passionate about. Here’s hoping that better recognition is given to our past heroes and let us use their experience in any small way we can. It is sad that their burning passion for sports is left to simmer inside them and not shared with the budding talent who are the future of the nation’s sports. AS a good thing is being put in place for the future of sports, it is saddening that it is riddled with so many controversies and uncertainties. It is even more alarming when it has to do with the development of sport and it deals with children. Two events related to the Frenz United international friendly against Liverpool and the ongoing international tournament organised by the privately owned football academy do not seem to be in the name of grassroots development — there seems to be a hidden agenda. Don’t get me wrong. I am all for development, especially by a private entity that is willing to pump a great deal of money into it. However, everything must be transparent and done in accordance with the rules. It puzzles me that the majority of the national Under-16 players who competed in the recent friendly against Liverpool Under-17 donned Frenz United’s colours. They are doing the same for the ongoing International Cup. It is fine for the academy to sponsor the national youth team’s participation, but for FA of Malaysia to allow their team to play under a private club’s name is courting trouble and undermining their own status. Even national Under-16 coach S. Balachandran was wearing the Frenz United jersey. Iran and Slovakia have sent their national Under-16 sides for the international tournament, but the Malaysian National Under-16 team is masquerading as a club team. Why? On Wednesday, Youth Football Academy (YFA) chief coach N. Radhakrishnan questioned why three players — M. Kogileswaran Raj, R. Dinesh and Muhammad Suazwan Salim — were part of Frenz United’s first XI instead of the national Under-16 team in the international tournament. Radhakrishnan claimed the three players had trained under his academy, which is funded by CIMB, since they were 10 and were released to the national set-up as they had impressed the national junior selectors. “YFA have not obtained a single sen in compensation from FAM for the development of the three players and they had surrendered the three boys to FAM in good faith. But now the players are turning out for another club. This will discourage other academies from supplying talent to the national set-up,” he said. He wants to know if FAM will release the three players to compete under his academy in a tournament in China in July. To make matters worse, the head of the Education Ministry’s (MoE) sports unit, Ee Hong, says they were unaware the national Under-16 team would play for Frenz United. MoE is unhappy with the whole affair and hopes FAM can resolve the matter amicably, taking into consideration the sports division’s concerns and the welfare of the players as they are students and come under its jurisdiction. FAM, on the other hand, say they had given clearance for this tournament and the national Under-16 team to play under Frenz United’s name. Why so many complications for a youth tournament, which is seen as good for the development of the game? It could even grow to become like the Gothia Cup — a tournament that is held annually in Gothenburg, Sweden, that is open to both boys and girls aged 11 to 19. It is the world's largest football tournament – in 2011, a total of 35,200 players from 1,567 teams and 72 nations participated in it. Gothia Cup had started in 1975 with 275 teams. Earlier, there were also some complications when the National Football Development Programme (NFDP) was announced by the Minister of Youth Khairy Jamaluddin. FAM stayed out of it initially. The matter has been resolved, but the programme has yet to be launched due to a delay in the ministry making a formal presentation to FAM and seeking a launch date. The NFDP could well be the answer to the country’s football woes as it is a long-term programme combing the length and breadth of the nation. Once the NFDP is formalised, FAM will have to play a big role to ensure the programme fully takes charge of development in the country — meaning all football academies and schools will have to register with them and run programmes that are sanctioned. Only with a proper coordinated programme can there be good results. If everyone wants to head in their own direction, we will continue to have conflicts and each entity will try to claim that it is better than the other. Before we get into such situations, it is wise that everything is in order from the start and any personal agenda is nipped in the bud to ensure that the NFDP is a success. It is of utmost importance that FAM, the Ministry of Sports, Ministry of Education, football academies, schools and clubs work hand in hand to ensure that the NFDP is not derailed in its infant stage itself. NATIONAL wushu champion Mohd Meeraj Omar’s need for funds to settle hospital bills for his deceased mother was so great that it was brought to the attention of the media. Fortunately for him, generous Malaysians responded positively to his plight. Meeraj had gone for a competition in China in the hope of winning the prize money to pay his mother’s hospital bills that had risen to RM90,000. His mother, a diabetic, had undergone an appendectomy at a specialist centre last month. Sadly, her wound became infected and the single mother passed away on Jan 3. But why did a national exponent, who has brought honours to the nation, have to resort to the media to seek funds? This was what a doctor friend of mine from Sabah, who has been involved with national athletes, asked me. She also wanted to know why did Meeraj’s mother went to a private hospital when there are so many government hospitals with top class facilities and doctors. Probably, Meeraj wanted the best for his mother. Indeed, where were the Wushu Association and the National Sports Council (NSC), which has a welfare department, when Meeraj was facing such a dilemma? The convenient answer would probably be that the athlete did not come forward with his problem. Does this mean there is poor communication between the officials and athletes? We boast of having top-class supporting staff for our athletes. But are they just for pre-competitions and competitions? Basically, the majority of athletes — unless you are in the top league — are on their own. They are assets to their respective sports associations as long as they can perform. Once they are injured or show a drop in form, more often than not, they are left to fend for themselves. When the athletes encounter social or domestic problems, they do not know who to turn to. No wonder they appeal to the media! It becomes an embarrassment to the respective sports associations when the problems of their athletes are highlighted in the media, but who is to blame for it? Meeraj has, so far, received RM14,000 in donations, including RM10,000 from an anonymous donor and RM2,000 from a retiree. The Malaysian Wushu Federation (MWF) has started a fund-raiser while the NSC has promised to offer Meeraj some assistance. Don’t the sports associations set aside some funds for such situations? The NSC has a welfare department and assistance should be readily available. So why make promises? While sport is said to be on the national agenda and billions of ringgit are spent on it, it is disheartening that the welfare of athletes is still back-burnered. Sports associations must not forget that they exist because of their athletes, although they will say the opposite is true. This is debatable, but for sport to progress, sports associations and athletes need each other and the welfare of the latter must take top priority. All we have to do is to look at past athletes who had brought honour to the nation in their heyday living in poverty, distress or illness with little or no help coming forth. Yes, we have Yakeb (Yayasan Kebajikan Atlet Kebangsaan/Welfare Foundation for National Athletes), but there is only so much they can do. National sports associations must have their own welfare and counselling units for their athletes. Here’s hoping for better treatment of athletes — both present and past — and not hearing of athletes turning to the media for help. ’TIS the season to be jolly, but not as far as Kuala Lumpur FA is concerned. It is staring at a bleak 2014. However, the officialdom at KLFA is oblivious of what it has done to the association and is still sitting pretty in office without a tinge of sadness or remorse. Kuala Lumpur has a shorter but proud history in the annals of Malaysian football. Having only made its debut in the M-League in 1979 after the association was formed in 1974, it worked its way up from minnows to the kingpin of Malaysian football. But now, for the new season, it has plumbed new depths - club-level football, the third tier of the FAM League. More humiliatingly, the association has been rocked by match-fixing allegations over the last two years. Last week saw its foreign coach for the season, its team manager, an official and five players banned for life from football and fined RM20,000 for match-fixing by the FA of Malaysia. Another seven players are expected to be hauled up today and could well face similar action. While it is commendable that the FA of Malaysia is serious about match-fixing, what sanctions has it meted out to KLFA? KL’s President Cup team was up to no good last season, but KLFA chose to turn a blind eye. And it put the KL team at further risk of match-fixing speculation when it enlisted a new sponsor for the 2013 season - Rising Sun Travel & Tours, which did not fully fulfil its sponsorship obligations. What’s puzzling is that KLFA let the sponsor have a say in the hiring of the coach and players and even in managing the team when it is clearly stated by the FA of Malaysia that the team must be managed by the association. When asked if late payment of salaries was the reason the players turned to bookies, KLFA secretary general Nokman Mustapha insisted that it was not. He claimed that KLFA paid its portion of the salaries, but the sponsor defaulted. But the players sign contracts with the association, which makes it fully responsible for their salaries, not the sponsor. According to Nokman, the Malaysian Anti-Corruption Commission (MACC) had asked to observe the KL team early this season and KLFA had given its blessing to the investigation. So, KLFA knew something was amiss, but did nothing about it, including curtailing the powers of the sponsor. It is fine to punish the guilty players, but shouldn’t KLFA president Datuk Astaman Abdul Aziz and his council also be blamed for the fiasco? The honourable thing to do would be to resign en bloc. Or the FA of Malaysia should punish them for their part in bringing the game to disrepute. All the hard work former KLFA president and mayor of Kuala Lumpur, Tan Sri Elyas Omar, put in to raise the standard of city football has been undone. The efforts of founder members like Datuk K. Rasalingam (the then secretary) and Goh Ah Chai (the then treasurer) have all gone to waste. To call KLFA poor would be a misstatement. With the assistance of KL City Hall, it has a home to call its own - the Bandar Tun Razak Stadium. KLFA manages the stadium and only pays booking fees to City Hall. Maintenance of the stadium is shouldered by City Hall. KLFA also get financial aid from City Hall. However, the KLFA-City Hall relationship hit a snag. As a result, the field in the stadium was neglected and the FA of Malaysia would not allow KLFA’s M-League matches to be held there last season. The matches had to be played in Malacca. Soon, KLFA will be without a home because City Hall intends to close the stadium for two years for renovations. The association is said to be negotiating with the latter for an alternative office space. Lest we forget, Elyas had acquired eight hectares in Taman Melawati for KLFA. The land was recently given to a company to develop in exchange for building the KLFA Academy Football Centre on 3.28 hectares of it. But work on the academy was unsatisfactory and after much deliberation and restoration, KLFA decided that it would privatise the academy. The Ministry of Sports assisted by turfing the pitch. A private entity currently manages the academy, which boasts a gymnasium, hostel and cafeteria, among other facilities. In return, KLFA got 10 per cent of the booking fees a month and now gets 30 per cent. The sad fact is that KLFA’s teams do not get a chance to train at the academy. It is also learnt that the developer had given KLFA a condominium but whether there are any returns from the property is unclear. Then, there is revenue from billboards also acquired during Elyas’ tenure, and surely KLFA can manage better with all this income. Today, a personal assistant of Astaman, who was initially brought in as liaison officer and was not supposed to cost KLFA any money, is the assistant secretary with a paid salary and calls all the shots in KLFA. She has also found a place on FAM’s media committee. Certainly, a great deal of things are not right with KLFA and need to be addressed immediately. The people who have brought KLFA to its knees need to pay for their sins. KLFA is not going to look good by punishing teenagers when the elders themselves are guilty of wrongdoing.